Hello and Good Morning! Happy Thursday! This April, the READ THIS! 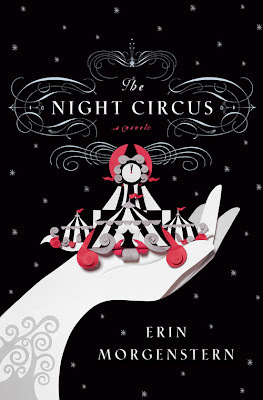 book of the month is The Night Circus by Erin Morgenstern. I finished this book a few nights ago, and while I don't want to give you my full review just yet, I can tell you that this book is, without question, my new favorite novel. Morgenstern crafts a world that you cannot help but to fall into, making the characters seem like friends you've known as long as you can remember and, at the heart of it all, sharing with the reader the most incredible love story. If you haven't started reading it yet, don't take my word for it, check out these other awesome reviews. Zoe Triska, for the Huffington Post, writes, "The book is engaging and magical, entrancing the reader every step of the way. Even the first three sentences of the novel, as seen above, transport the reader to another place. With creations such as a beautiful garden made entirely of non-melting ice, and a house of mirrors that shows you more than just distorted images of yourself, Morgenstern creates a circus of which one can only dream. What better name name for it then than "Le Cirque Des Rêves" - French for 'The Circus of Dreams'?" Rachel Syme, for NPR, writes, "This fall, Knopf/Doubleday is pinning its hopes on Erin Morgenstern's The Night Circus, the story of two young magicians pitted against each other in an intricate, mysterious and lifelong competition. Their contest is set against the background of an extravagant Big Top, a twinkling, dazzling, traveling circus that puts down stakes in the dark of night and vanishes before dawn. [...] Morgenstern is both a writer and a visual artist, and the world of The Night Circus is elaborately designed, fantastically imagined and instantly intoxicating — as if the reader had downed a glass of absinthe and leapt into a hallucination. [...] Morgenstern conjures a setting so intricate and complete that imposing a plot on it feels almost worthy of extra credit." And Sarah Stegall, for SFScope, writes, "Erin Morgenstern makes [the circus] the setting for The Night Circus, which is a love story, a magic duel, a mystery. It is one of the best novels I have read in years. [...] The trappings of this tale are magnificent. From the opening sentence to the last, Morgenstern shows a fine and subtle hand. Her prose is as delicate and nuanced as the delights the magicians surprise one another with. Imaginative "acts" go far beyond the dog-and-pony shows of Ringling Brothers; we are offered eternal flames, stories trapped in bottles, an ice garden, a bubble maze. The circus itself is shrouded in mystery and magic; it comes and goes overnight, without warning. The story winds about like the maze of the circus itself, circles within circles, where time is so fluid that readers are wise to check the date at the beginning of each chapter to locate their place in the story. [...] The Night Circus scintillates in the mind, reflecting the author's mixed-media orientation as both artist and writer. [...] I understand that this is Ms. Morgenstern's first novel [and] it is a breathtaking debut." However, this is Morgenstern's first novel (as Stegall notes above) and as she is an unseasoned writer, her novel has been met with some criticism. Stacey D'Erasmo, for the New York Times, writes, "In “The Night Circus,” her debut novel, Erin Morgenstern works hard to create just such a sense of magic, but there finally seems to be something too sensible about her sensibility to pull off the trick. The novel is — and it’s an odd thing to say about a work of fiction — just too real to be believed. True magic is dangerous, and there is little of that sort of propulsive danger in these pages; where it does occur is surprising, and oddly marginalized. [...] Strangely, the two most powerful kinds of magic there are — the power of cruelty and the power of love — receive the least page time here. [...] One wishes Morgenstern had spent less time on the special effects and more on the hauntingly unanswerable question that runs, more or less ignored, through these pages. [...] It’s not as pretty a spectacle, but that’s a story that grips the heart." Finally, Olivia Laing, for The Observer, writes, "The Night Circus is a strange beast, creakily plotted but boasting a fabulously intricate mise en scène. [...] While even the best fantasy novels don't sound particularly convincing in precis ("and then the hobbit had to escape from a giant spider"), Morgenstern's strength evidently doesn't lie in her ability to construct a narrative. [...] Aside from a vague nod at costume, there's no real sense that an authentic world, either historical or counterfactual, exists outside the circus gates, and though this increases the intensity it also leaves the book feeling oddly unmoored. [...] There is an appealing zest to this and the many other wonders that Morgenstern has created, and if her book isn't entirely satisfactory in the ways one might expect, it still functions as an eminently intriguing cabinet of curiosities." While there have been some less positive reviews of pieces of Morgenstern's first novel, one thing that it seems everyone can agree on is how beautiful the setting of her story is. This tale, although sometimes struggling stylistically at times, is an incredible and breathtaking journey that will leave you feeling in awe of this amazing world. I hope you'll start reading, if you haven't already, and join us for the official review at the end of the month!